Voice of the Collector: Were You in the Club???? Do you remember this? 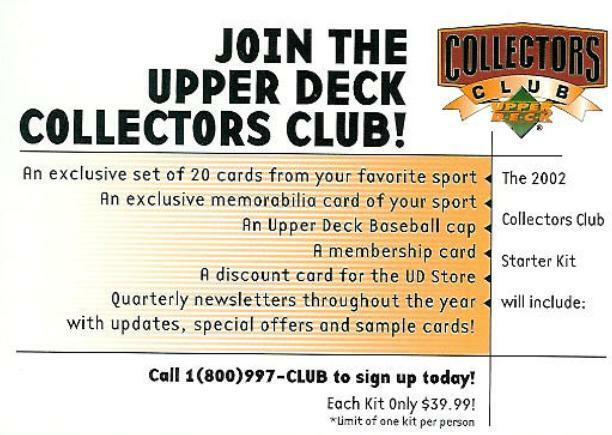 Ok, an honest show of hands, how many of you were in the Upper Deck Collector's Club? I'll admit I was and I think I still have my custom made Ken Griffey Jr bat card to prove it. I don't think they do this anymore. Probably because at $40 it was way too pricey for most people. I remember getting a show deal somewhere that cost me about half of that or I never would have been either. I used the UD baseball hat on a snowman this winter that my daughter and I made. 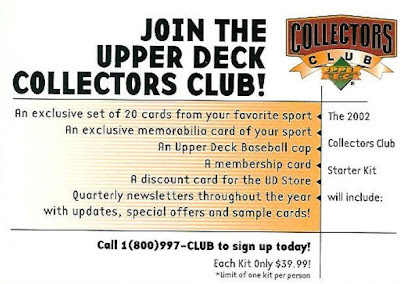 If Upper Deck was smart (which has been questionable at best lately) they would roll this back out but market it to kids via a wrapper redemption or points program instead of additional cold hard cash. Wrapper programs are pretty fun.. Encourages buying. Rittenhouse is fairly successful with it and they offer some cool stuff..